Energy Transformation is nothing but simply converting one type of energy into another form. In India about 2200 years back, the hydraulic energy was first converted into mechanical energy. This done by passing the water through a water wheel. India is the inventor of water wheels which then taken to Egypt and then to Europe and finally to America. 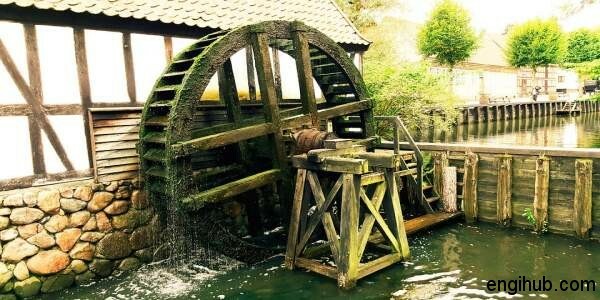 These water wheels are originally made of wood and can be seen in Technical Museums even today. 300 years back Water Wheel is taken as a model for the systematic design of Water Turbines. After the invention of the water turbine, a lot of research is being conducted all over the world to improve its design and performance. Nowadays Turbine is known by each and every engineering background person. The construction of water wheel is very simple and anybody can understand it very easily. Generally, a water wheel consists of a central hub and a circular wheel. The numbers of buckets or vanes are mounted on the periphery of the wheel. The water is delivered to the wheel at some convenient point on its circumference, which falls into the buckets or strikes the vanes. Due to weight or impulse of the water, the wheel starts rotating. In old days Water Wheels are used to lift the water from lower end to higher end. This will help in irrigation in agriculture. This technology is very rarely used nowadays but it was very useful in ancient days. Nowadays water turbines are used to generate hydroelectric energy. Water Wheels have some advantages and have some disadvantages also.